Today was JobBridge day. The National Internship Scheme announced as part of the Jobs Initiative was launched by Minister for Social Protection, Joan Burton and An Taoiseach, Enda Kenny. The new programme is not dissimilar to the Work Placement Programme which I commented on last month, apart from the extra €50 payment to interns. Even Tesco are in on the act despite the shenanigans I mentioned on their Town Planner ‘job’. Those on Work Placement Programme and Gradlink can transfer over so at least they get €50 extra a week. The website outlines the protections for interns and responsibilities of the ’employers’ and a monitoring/compliance process. All the big names mentioned as taking part can afford to hire staff but are hosting interns and not having to pay a penny for the labour offered by the desperate. Minister Burton mentioned that it was like job interview for a longer period of employment. Laura Slattery notes that this will place interns under huge pressure as the 9 months runs down. As Deputy Murphy is not a legal entity he can’t hire an intern through Job Bridge says the Mnister. But Deputy Murphy is not put off by this and wants the Houses of the Oireachtas to do the hiring for him. Barry Cowan (FF, Laois/Offaly aka the brother) thinks that organisations who have no employees should be able to take on interns – ie. those who have CE workers or no money to hire their own staff eg. all those organisations in the voluntary sector who lost their funding in the last 3 years. He accuses Minister Burton of missing an opportunity. What opportunity is that? One of looking busy, working with nobody and with no supervision? Good luck to those looking for work and taking up courses or internships, I hope they are successful periods and that full paid employment follows and that those companies who might/will abuse the programme are publicly named and shamed. I don’t think that companies should get interns for nothing and find myself in agreement with IBEC who had called for them to be supported financially by the employers. One impact of the Jobs Initiative and retraining programmes which has received no mention to date is the exclusion of many disabled people. Springboard which is a further education initiative for the longterm unemployed and Job-bridge both excludes people who are in receipt of Disability Allowance. Many people with disabilities are on Disability Allowance because with it comes supports for people’s disabilities including Free Travel, Mobility Allowance and Household Benefits package. Having a disability costs money – more that the cost of ‘simply’ being unemployed and requiring welfare support. There are often extra housing, transport, food, laundry, heating costs relating to ones disability – charging electric wheelchairs is not cheap either. (However if you are not living alone you may not get the extra benefits and all of this is apart from the difficulties presented in getting support services including personal assistance.). So if you lost your job and you have a disability many people are more likely to reapply for Disability Allowance because the additional benefits in some way recognised some of the extra costs. If you went to college and graduated and were on Disability Allowance all the time you are in college you are more likely to remain on it while you are looking for work. The government have decided that those on DA cannot apply for internships or Springboard. They must transfer to Job Seekers Allowance or Benefit. I placed a formal query with the department and received this reply. Springboard places are available to customers who have been in receipt of a Jobseeker’s payment or One-Parent Family Payment for the six months before the start date of the course. Periods on Disability Allowance also count towards the six months. Once a customer moves to a Jobseeker’s payment from a Household Benefit qualifying scheme, the Household Benefits and Free Travel entitlement ceases and no underlying entitlement exists when undertaking a Springboard placement. In plain english this means that if someone on Disability Allowance transferred to Job Seekers they would lose everything extra if they wanted to retrain under Springboard. On the JobBridge front the Department said the same. The National Internship Scheme will be available to individuals who are on the Live Register and have been in receipt of Jobseeker’s Allowance or Jobseeker’s Benefit or signing for jobseeker’s credits for at least 3 months. In the effort to manage the live register and deal with the long term employment figures it’s clear despite meetings/protests on the issue that the government have excluded those people who are unemployed and on Disability Allowance who would be ‘capable’ of work from their initiative. Last week the Minister for Social Protection announced the establishment of an expert committee on Tax and Social Welfare. Sadly it won’t be dealing with the disability poverty trap either. 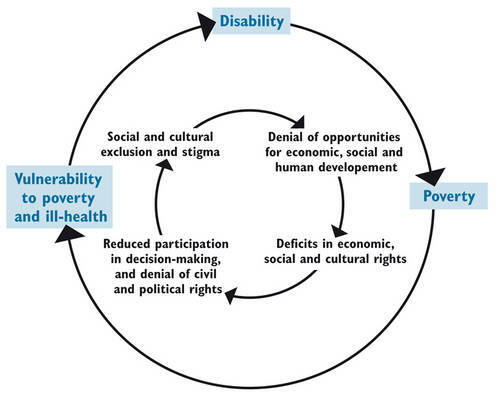 The cycle of exclusion will continue as the greater numbers of able bodied unemployed need managing and policy on support of smaller numbers of people with disabilities beyond education languishes in a report or not even considered at all.